Removing the dangerous misnomer “Urban” from the park name. The Conservative Party and its candidates did not reply. “It is encouraging that so many federal candidates are willing to act locally to amend the Rouge National Park legislation to prioritize ecological integrity and respect conservation science” says FRW President Kevin O’Connor. “There is a clear need to implement existing Rouge Park, Greenbelt, ORM and watershed plans to improve water quality and biodiversity, and combat dangerous pollution, climate change and flooding risks.” says Jim Robb of FRW. Question 1: If elected, will you support amendments to the Rouge National Urban Park Act and draft park management plan to support the implementation of the: Greenbelt Act and Plan (2005); Oak Ridges Moraine (ORM) Conservation Act (2001) and Plan (2002); Rouge Park Management Plan (1994) and Rouge North Management Plan (2001); Little Rouge Corridor Management Plan (2007); Rouge Park Natural Heritage Action Plan (2008); and Rouge (2007) & Duffins (2003) Watershed Plans. Question 3: If elected, will you support amendments to the Rouge National Urban Park Act and management plan to ensure timely implementation of the Greenbelt and Rouge Park North “main ecological corridor” and Environment Canada’s science-based recommendations for improving biological diversity and water quality? Question 4: If elected, will you support enlarging the National Rouge Park to 100+ km2 by including existing Rouge Valley and Park lands in Scarborough and Markham, and 24 km2 of additional federal lands in Pickering to shrink the Pickering Airport Zone? Question 5: If elected, will you support amending the Rouge National Urban Park Act to remove the dangerous misnomer “Urban” from the park name. 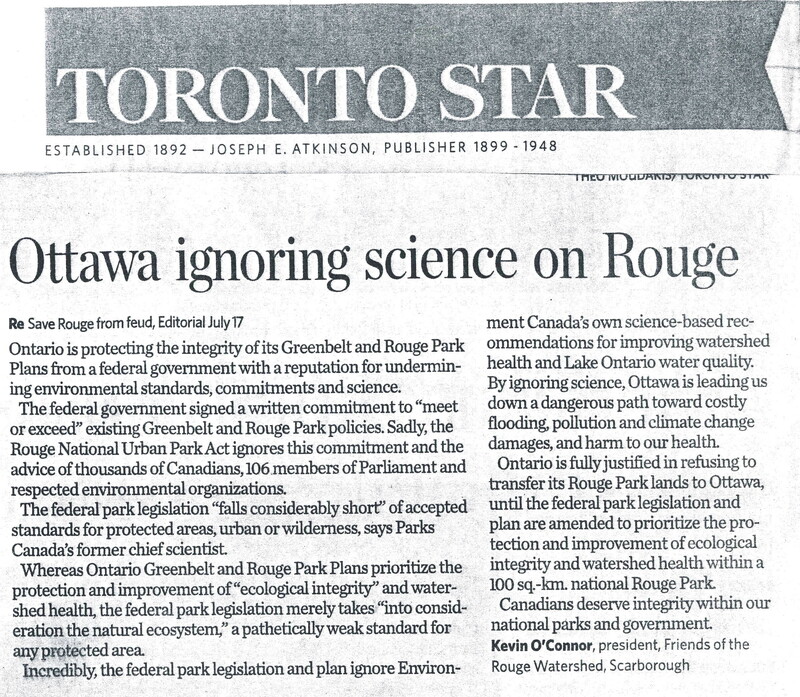 A PDF showing letters to the editor of The Globe and Mail from a former Parks Canada chief scientist and FRW’s president slam Rouge National Urban Park legislation.